Mobile Music Polyphonic: Free ringtones download, Follow us now! Make ringtones by yourself. Mobile Music Polyphonic(Mobile Ringtone Suite) is a powerful ringtone composer and converter suite, which allows you to convert midi, both audio and video files to cellphone ringtone format, including M4R(iPhone ringtone), mmf (smaf format) and amr. With the composer, you can convert midi to m4r, midi to amr, midi to mp3, midi to awb, and midi to mmf. And compose your own unique iPhone ringtone by direct clicking on music lines. Convert between m4r, mmf, mp3, wave and amr format. Support iPhone, Nokia, Sony Ericsson, Samsung, Siemens and more brand polyphonic ringtone mobile phones. You will be able to enjoy your own unique and funny ringtone. 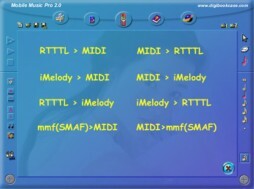 Convert midi mp3 wave avi rmvb amr mmf to iPhone ringtone, mp3 to mmf. Include iPhone Mobile Ringtone Converter + iPhone Mobile Ringtone Composer. Save part midi data from long complex midi to ringtone. Convert midi to m4r, mp3, amr, awb, mmf. Convert all audio/video to m4r iphone ringtone format and mmf. Audio fade in and fade out is supported. Convert between m4r, mp3, wave, mmf, amr-nb, amr-wb. Ringtone Converter - Ringtone converter allows you to add new ringtones to your mobile or cellular phone. Mobile Music Pro - It is batch MMF Ringtone RTTTL Ringtone MP3 MIDI WAV Converter and composition software. It is mainly for ringtone website user. WAV MP3 to MIDI Converter - A powerful MP3 to Midi Converter can convert MP3 to MIdI, WAV to MiDi, CD to MIDI etc. Mobile Buddy - Create your own ringtones and logos for mobile phones! convert pictures / songs into ringtones and logos. Hot! i-Sound MP3 WMA Recorder - turn your computer into complete audio recording studio! Super MP3 Recorder Pro - record sound to mp3, wav on-the-fly.